LEAWOOD, KS (October 5, 2015) – When 15-year old Corey Cullaton was looking for a project to earn his Boy Scouts of America Eagle Scout Badge, he came up with the idea of combining the family business and his desire to help a military veteran. Through the National Auto Body Council’s (NABC) Recycled Rides® program, Cullaton was able to help two U.S. Army veterans receive new transportation. Cullaton, a member of Boy Scout Troop 106, has been in Scouts since he was six years old, and is currently an active member of his high school’s JROTC program. He has also grown up in the collision repair industry. His grandfather, Fred Haberl is the owner of CARSTAR Autobody Resurrection in Lakeland, FL. His mother, Heather Cullaton owns ARC Towing, located just a block away from her father’s shop. 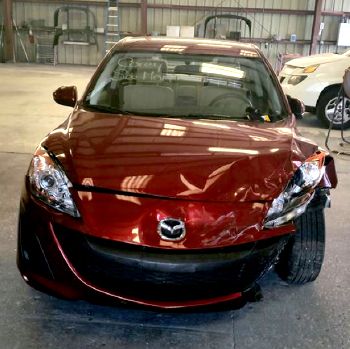 Cullaton started his project in June with a slightly wrecked 2010 Mazda 3 with only 16,000 miles, which was donated by his mother’s ARC Towing company. He was involved in every aspect of the repair. He did a lot of the hands-on work to the car himself. He also sourced donations and discounts for parts and mechanical work. What started as a one-car donation, ended up becoming two. Cullaton’s grandfather was able to get a second car, which was donated by Allstate. That car, a 2009 Toyota Camry, was repaired at CARSTAR Autobody Resurrection with the help of Corey’s 17-year old brother, Bradley. To find the proper recipients for the car, Cullaton started with the Polk County Veterans Council. They put him in touch with Clark’s House, Inc., an organization that helps provide basic needs to homeless and at-risk veterans and their families. Pamela Washington and Tanya Mann, both U.S. Army veterans, received their cars on October 3, 2015, at an event promoted by Cullaton at CARSTAR Autobody Resurrection. Lakeland, FL, Mayor Howard Wiggs was the keynote speaker at the event. In the end, Cullaton was able to get a complete learning experience out of the project. NABC Recycled Rides is a nationwide community service project whereby members of NABC repair and donate recycled vehicles to families and service organizations in need in their own communities. Recycled Rides recruits collision repairers, insurers, paint suppliers, parts vendors and others to contribute in their own, yet synergistic ways. The number of CARSTAR stores who participate in the program has grown steadily since it began. In 2014, CARSTAR locations delivered nearly 20 vehicles to families in need.